A warning about imminent annexation of the West Bank was given on Tuesday by UN Special Rapporteur for Human Rights in the Occupied Territories S. Michael Lynk, on the eve of his delivery of his annual report to the General Assembly. Israeli parties and politicians are expressing aspirations for annexation, and there is higher and higher public approval in the Israeli public. The UN human rights monitor said that he has not been permitted to enter the Occupied Palestinian territory by Israel since his appointment in March 2016, and visits Amman, Jordan, to receive reports and confer with Israeli and Palestinian human rights activists and witnesses. I think here, as part of my closing remarks, might be a good time to revisit Oslo’s assumption about sustainability, which is premised on the supposedly irreducible fact that Israel has no demographic or political choice but to withdraw from all or most of the occupied territory and allow a sovereign Palestinian state to emerge if it is to retain its Jewish character and democratic values. First, I think this assumption fails to account for the creative thinking among the ascendant Israeli right — that it can comfortably live with the model of permanent rule over the Palestinians that would deny them citizenship and democratic rights. Secondly, I say that overlooks the striking degree of control that Israel exercises over the Palestinians, as it confines them to smaller, denser, and more fragmented islands of land through a sophisticated security method of walls, checkpoints, control over the population registry, and overwhelming military superiority. Third, I think this assumption overestimates the willingness of the Oslo sponsors — particularly Europe, which is Israel’s largest trading partner, and America, its military and diplomatic patron — to challenge Israel with any meaningful consequences should it retreat, as it has, from any lingering commitment to a genuine two-state solution. Fourth, it disregards Oslo’s escape clauses that have allowed Israel to pocket the cost-free features of the occupation, the large amounts of European and international aid to fund the Palestinians, and the annual $3.8 billion dollar military package that the United States gives to Israel, while Israel continues to thicken its presence throughout the West Bank and East Jerusalem, and continues the blockade of Gaza. And finally, I think, this assumption begs the question of whether a genuine two-state solution was ever possible in the absence of the international community’s political will to enforce the clear obligations and prohibitions of international law that could have stemmed Israel’s revanchism over the last half century. Lynk pointed to the reprieve of the village of Khan al-Ahmar as giving him hope, protected by the work of Jewish and Palestinian human rights activists and civil society organizations. “They are the bridge to each other. They all speak the language of human rights. They are fluent in it. And the work they do is highly professional, and to me they are the genesis of what a future society, either a genuine two-state solution or a one-state democratic solution, could wind up looking like in Israel and Palestine. They give me hope, or else I would have left the job some time ago, because it’s dreary and it’s soul-destroying to tell you all this depressing news without telling you there is some hope for some optimism, some rainbow beyond all this,” he said. Arab member of the Israeli Knesset yesterday visited the Khan Al-Ahmar Bedouin village, east of Jerusalem, in solidarity with residents who have been threatened with eviction. MKs Massoud Ghanayim, Abed Al-Hakim Hajj Yahiya, Talab Abu Arar and Said Al-Khawarizmi were received by a local committee at Khan Al-Ahmar who updated them on the latest development regarding the village’s situation. The MKs expressed their solidarity and support of residents of Khan Al-Ahmar against the Israeli occupation’s bulldozers. We will continue to stand by the residents in their struggle, and will not remain silent in the face of the government’s efforts to expel natives from their homes in favour of settlements and the annexation of the territories. In September, the Israeli High Court rejected an appeal against the demolition of the village and ruled in favour of its evacuation and demolition. Khan Al-Ahmar has been under threat of demolition by Israeli forces since July; the demolition would leave more than 35 Palestinian families displaced, as part of an Israeli plan to expand the nearby illegal Israeli settlement of Kfar Adummim. Israeli forces have demolished the village of Al-Araqeeb in the occupied Negev desert for the 135th time, local sources reported yesterday. Al-Araqeeb’s residents told Arab48 that Israeli bulldozers, reinforced and protected by the occupation forces, stormed the village and proceeded to demolish all the Palestinian houses and tents there, displacing women and children despite the “cold weather and rain”. After the demolition was completed, the residents added, Israeli forces arrested four of the village’s inhabitants, including Sheikh Al-Araqeeb, Sheikh Sayah Al-Turi, Aziz Sabah and his wife, and Selim Mohammed Abu Medegham, for allegedly “obstructing the work of police and the demolition crews”. 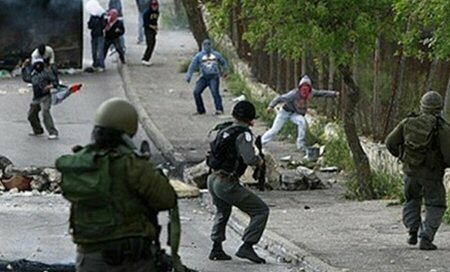 The locals explained that the detainees were transferred by occupation forces to a detention centre for interrogation. Earlier this week, scores of Palestinians, including officials, demonstrated in support of Al-Araqeeb. The Negev village of Al-Araqeeb was first razed in 2010 under pretexts that it was built without the needed licenses. The last demolition was carried out earlier this month. Al-Araqeb is one of 35 “unrecognised” Bedouin villages. According to the Association for Civil Rights in Israel (ACRI), more than half of the approximately 160,000 Bedouins in the Negev reside in unrecognised villages. Right groups say that the demolition of unrecognised Bedouin villages is a central Israeli policyaimed at removing the indigenous Palestinian population from the Negev and transferring them to government-zoned townships to make room for the expansion of Jewish Israeli communities. The Israeli army will investigate the Iron Dome missile defence system’s failure to intercept a rocket fired from the Gaza Strip on Wednesday night, Israeli radio station KAN reported. The station said yesterday that this is the third time in a row that the Israeli defence system has failed to intercept rockets fired from Gaza in recent days, adding that a few weeks ago the system automatically launched missiles without reason. “The Iron Dome wasn’t meant to intercept the rocket that landed last night in Eshkol. [The rocket] was heading toward open land,” the Israeli army spokesperson, Brig. Gen. Ronen Manelis told the Army Radio yesterday. The Israeli air force yesterday carried out eight air strikes on three sites in the north and south of the Gaza Strip. Palestinian Education Minister Sabri Sidem accused Israel, Thursday, of “falsifying” the Palestinian curriculum in schools in occupied Jerusalem. “The occupation authorities removed the Palestinian flag from all books covers, the Palestinian keffiyeh, and the name of the State of Palestine and its Eagle Logo as well as the phrase ‘Ministry of Education and Higher Education,’” he clarified. Israel, which has occupied the city of East Jerusalem since 1967, seeks to impose the Israeli curriculum on Palestinian schools, in a move that the Palestinian Authority rejects. A few weeks ago, I wrote about how Israel’s military intentionally targets Palestinian media workers covering the demonstrations on the Gaza fence, many of whom were killed by direct sniper shots hundreds of metres away from the fence. I also wrote, in another article, about how Israel’s court tried Palestinian poet Dareen Tatour and sentenced her to two years in prison for writing a poem reflecting her sympathy for the tragedy of her fellow Palestinians. I also mentioned Lama Khater, a Palestinian journalist, writer and a mother of 5 children, who was arrested at her home in the middle of the night and accused of building an armed terrorist organisation. These are not isolated incidents, but rather represent a mind-set and systematic practice based on pre-prepared plans. GAZA, PALESTINOW.COM — Israeli warplanes carried out an airstrikes’ campaign across the besieged Gaza Strip, predawn Thursday. Local sources said, according to Ma’an, that Israeli warplanes fired two missiles towards a military site belonging to the al-Qassam Brigades, the armed wing of the Hamas movement, in Rafah district, in southern Gaza. Sources confirmed that Israeli warplanes targeted a site in Khan Younis district, also in southern Gaza. Israeli warplanes also targeted a site in al-Shiekh Zayid City, in northern Gaza. No injuries were reported, however, the airstrikes led to extensive material damages in the targeted areas. Hebrew-language news outlets reported that Israeli warplanes carried out eight airstrikes targeting Hamas sites, after one shell was fired from Gaza towards Israeli communities surrounding the Strip had landed in the Eshkol Regional Council. The shells reportedly exploded in an open area; no injuries or damages were reported. Sources added that the Israeli army spokesperson issued an official statement following the airstrikes, claiming that among the sites targeted were a military compound, a training camp and a weapons storage facility belonging to Hamas. No response from Hamas officials was given. RAMALLAH, PALESTINOW.COM —The health condition of Palestinian prisoner Khader Adnan has taken a serious turn for the worse, as his open-ended hunger strike has been ongoing for 53 consecutive days to protest his arbitrary detention in Israeli lock-ups. She added that Adnan cannot stand on his feet and moves on a wheelchair. Recently, Muhjat al-Quds Foundation said prisoner Khader Adnan declared his open-ended hunger strike in response to being held arbitrarily in Israeli dungeons. Dozens of solidarity activists and journalists, on Wednesday evening, suffered from tear gas inhalation, during Israeli occupation forces’ repression of a peaceful march at the Jerusalem Gate, in the town of Abu Dis, southeast of occupied Jerusalem. Resistance to the wall and settlements, along with activists of the Popular Resistance Committees, Fateh and national action groups organized a peaceful march in protest against the plan to deport the residents of Red Khan to the area. The participants, including the Minister of the Wall and Settlements Resistance Committee, Walid Assaf, raised Palestinian flags during their presence in the area near the Jerusalem Gate and chanted slogans “Go out, Occupation”. The spokesman for the Popular Resistance Committee, Hani Halabiya, pointed out that Israeli forces repressed the participants using gas, sound bombs and rubber-coated metal bullets, leading to dozens of suffocation cases. He added, according to Al Ray, that soldiers stormed the area of the Jerusalem Gate, intended for housing the Bedouin communities located on the eastern side of Jerusalem, and destroyed the water reservoirs. The Israeli Knesset passed a decision, three years ago, to seize lands belong to the residents of Abu Dis, an area of about 67 dunams, and to be used for the construction of mobile homes to accommodate the Bedouin communities, including the Red Khan, after being forcibly deported from the surrounding communities East of Jerusalem. 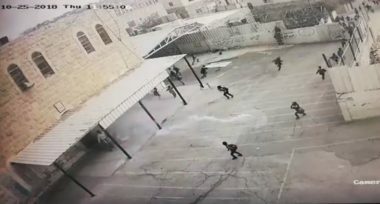 Israeli soldiers fired, Thursday, several gas bombs into the Nahda Basic School for Boys, in the southern West Bank city of Hebron, causing dozens of students and teacher to suffer the effects of teargas inhalation, including some students who fainted. Rawhi az-Zaro, the principal of the school, said the soldiers surrounded the school and fired dozens of gas bombs directly into its campus. He added that dozens of children and teachers suffered the severe effects of teargas inhalation, including some who fainted, and required urgent treatment. Az-Zaro stated that the soldiers also fired gas bombs and workers of the Hebron City Council, near the school, causing them to suffer the severe effects of teargas inhalation. The principal said the school administration contacted the Palestinian Education Ministry about the attack, and the Palestinian District Coordination Office to demand the military vehicles to avoid driving near the schools during the times when students are arriving or leaving it.